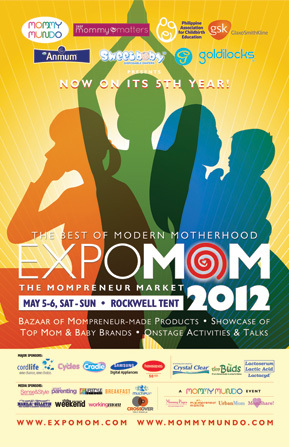 The theme for this year’s Expo Mom 2012 is the BEST OF MODERN MOTHERHOOD! This will be a 2-day event on May 5 and 6 at the Rockwell tent, expo hours are from 10am to 8pm. We will have more than 60 booths, an onstage program, lots of gimmicks and fun suprises. There will also be a stroller parking area, kids play area, food booths, and a mommy lounge. Entrance to the expo is 25 pesos which will go our MomShare outreach projects. With this entrance fee, each mom gets a free expo mom 2012 shopping bag. Mommy Mundo Passport holders get in for free and also get an Expo Mom 2012 goodie bag containing freebies and magazines from our valued sponsors.